If you do not plan to rebuild your flood-damaged home until next year, you must prepare it for winter. Ice layers can form in the ground when the frost line is near the ground water table, causing the soil to lift. This is known as frost heaving. It can lift the foundation and basement floor and walls, damaging them and other parts of the structure. Frost heaving is more likely if the water table is high and the soil is a clay or silt instead of well-drained gravel. Also, very wet soils will expand when water in the soil freezes. This can push basement walls laterally enough to crack them and damage the home’s structure. 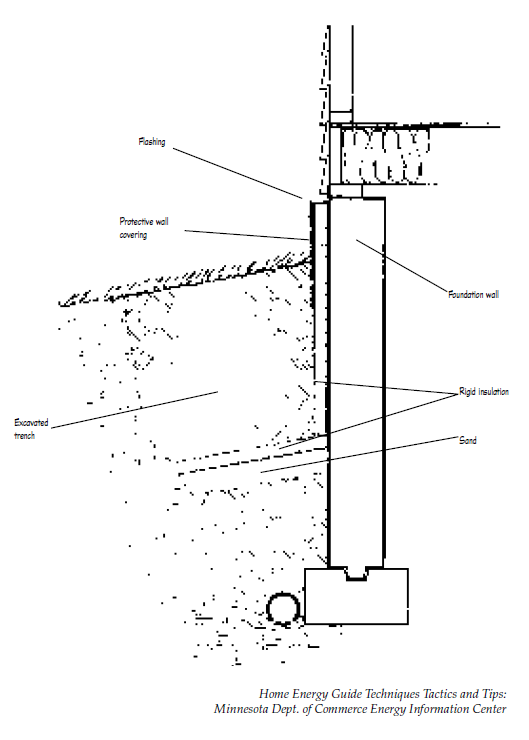 Again, this is more likely in low-porosity soils, such as clay or silt, and may be more of a concern with concrete block walls than poured concrete walls. Insulate the basement ceiling and place insulation on the exterior of the basement walls to reduce the potential for frost heaving. Polystyrene or other closed-cell insulation works well for exterior insulation. Soil provides little insulation, so placing insulation on the exterior of the house next to the basement wall is important. Snow is an excellent insulation, so piling it near the house is another option. A vented heater that discharges moisture vapor and other combustion products outdoors is a good heat source. A nonvented space heater will produce about ½ gallon of water for each gallon of fuel burned, which will release a large amount of moisture into the heated space. A warm, moist environment could lead to the development of mold. Carbon monoxide is a concern with combustion heaters, so place a carbon monoxide detector in the heated space. Also place a vapor retarder (polyethylene sheet) on the warm side of the insulation inside the house to limit the amount of moisture that may move through the insulation and condense on the cold surface behind the insulation. This condensation can lead to mold growth and structural damage. One way to limit the potential for frost heaving is to make sure the soil contains little moisture. To do that, have granular fill along the basement walls and footing as well as under the basement floor, then use drain tile and a pump to remove the water from the granular material. Moisture vapor from the wet soil will continue to come through the basement walls and floor, creating a damp environment, so provide air exchange, such as by opening basement windows for a short time, to remove the moisture. Many dehumidifiers will not operate properly at temperatures near freezing, so using one may not be feasible. Frost may freeze water in water lines under the floor or near the basement wall, causing the pipes to rupture. Water also can freeze in water lines in an unheated basement, so keep the temperature in the basement above freezing. Another option is to shut the water off at the street and drain the water from the water line or add antifreeze made for water pipes to the water line. Also fill sewer drain water traps, the U-shaped pipes that keep sewer gas from entering the home, with RV antifreeze to keep the water from freezing and damaging the pipe. Attach sheathing on all corners of a house if the exterior sheathing has been removed, or use another method of providing lateral bracing. Exterior sheathing is important because it provides structural strength for the structure. Studs provide vertical but not lateral strength. Do not allow snow to melt inside the house. Each 10 inches of snow can hold about an inch of water. Wrap the house in plastic to keep the snow out, and remove any snow that enters the house.